Friends ... all you have to do is walk down any street in Venice to know that there is a massive issue with income inequality in our community. I believe it is THE issue of our time for our entire country. The way that you begin to understand any issue is through the stories from the people that it affects. So, when feeling an intense need to DO SOMETHING about it, and sharing stories about it, you start to come up with ideas for solutions ... and the way to do that is always knowledge. Learning about the roots of an issue, and going from there. My friends Colin Gray and Megan Raney Aarons ("The Sibs") are longtime Venice residents and filmmakers, with several successful documentaries already under their belts, and they saw the same multi-million dollar houses with tent cities in their Venice backyards that I did, and once we got to really talking about it all, we felt that Venice could be zoom-lensed on as an example of what is happening across this nation ... and begin to do something about it. 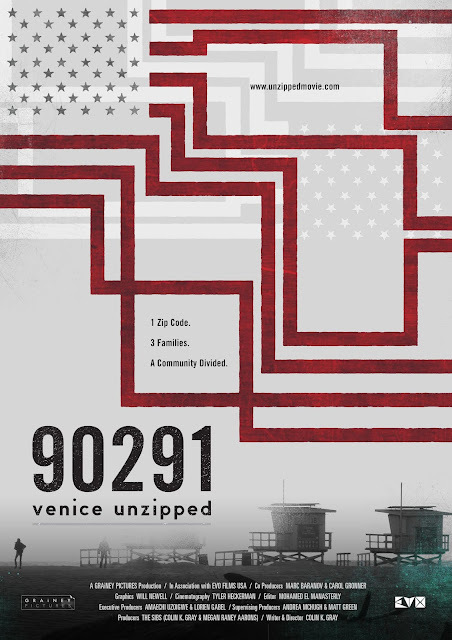 90291: VENICE UNZIPPED is the film we are setting out to make. We'll embed with three families - one homeless, one middle class, and one wealthy - living in almost unimaginably different circumstances here in Venice. We'll also talk to friends and neighbors across all income and cultural divides, interview local and national thought-leaders from multiple points of view, and attempt to make some sense of it all. Will it be a cautionary tale about what not to do to a vibrant, diverse community ... or a success story about how people came together to preserve what is wonderful and historical about this place, and how we looked after our own? Time will tell ... and shooting begins soon. All films take funds to create, and we are holding our first fundraiser at The Lantern House in Venice on June 16th, and we would love for all of you to be involved. Come to the fun event. Send a little (or big, if you can!) tax-deductible donation via our fundraising link HERE. (A detailed equity investment prospectus is also available upon request HERE. Donate to our silent auction of unique Venice items (let us know asap if that's a way you'd like to contribute, so that we may also promote you in the process!). Share your own stories with us, or point us in the direction of a good tale. This is going to be a film for our entire community, and thus, entire community involvement is crucial to telling the whole story. We are also starting our search for the three families we’ll be embedding with in our documentary. If anyone has a suggestion for a family who might be willing to participate in our film, please contact us HERE. We’re looking for one homeless couple / family with or without kids, one middle class family with kids, one wealthy family with kids. We will be very mindful of everyone’s time and space. The plan is to film these families for 6-8 days total, each family, over the next year. The fundraiser information, donation links, and the link to our brand new trailer are again all below. Please read, watch, share, and chime in to let us know what you think! This project is for all of us. As a friend of Venice Beach and this eclectic, world renowned community… We Want You! Come be a part of our feature documentary's grass roots fundraising event on Saturday June 16th from 7- 9pm. Hot links to RSVP and for tax-deductible donations are in the attached PDF, as well as below. 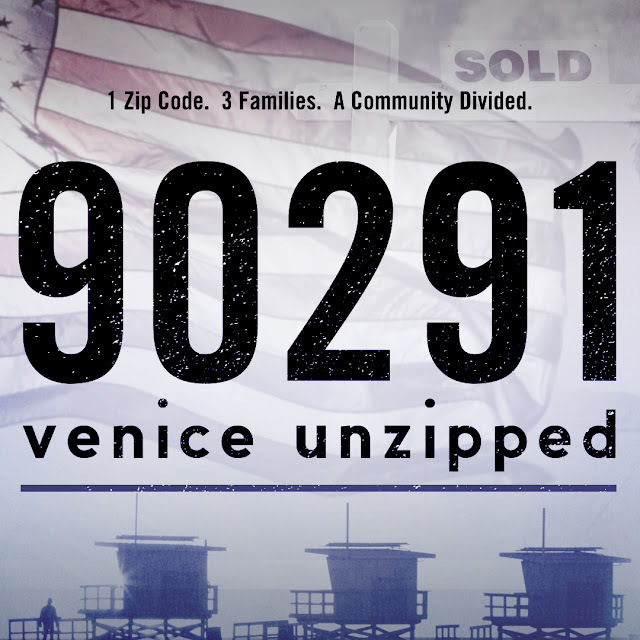 The film: 90291: VENICE UNZIPPED is a provocative feature documentary about income inequality in America, told through the lens of one community and three families living in the same 90291 zip code, but at the opposite ends of the growing income divide. In the film, we’re embedding in Venice, California, the once gritty, artistic and working class beach city, now the epicenter of gentrification in Los Angeles and a growing homelessness crisis. We’ll follow three families - one homeless, one middle class and one wealthy - living in almost unimaginably different circumstances, while putting a human face on Venice’s vanishing working and middle class. We’ll then follow a proposed homeless housing project that’s splitting the community in two, make connections to gentrification and affordable housing issues in other cities, and investigate how poverty is being criminalized in America. Is Venice, the last beach city of color, a cautionary tale about an eclectic community’s demise, or can solutions be found for protecting other income diverse cities across the United States? Style: The film's point-of-view is investigative, fact-based, and deliberately non-partisan. Rounding out our embed coverage will be interviews with local and national thought-leaders from multiple points of view. The team: Brought to you by long time Venice locals - writer / director Colin Keith Gray and producer Megan Raney Aarons (AKA “The Sibs” - Atari: Game Over, Being Canadian, Freedom’s Fury); journalist / co-producer CJ Gronner (Blogtown); political consultant / co-producer, Marc Baranov; EPs Amaechi Uzoigwe (Run The Jewels) and Lorien Gabel (Interlog, PINGG); Supervising Producers Matt Green (Refuge Wild) & Andrea McHugh (Hell’s Kitchen, Oprah Winfrey Show, Ghost Hunters); Emmy award winning editor Mohamed El Manasterly (The Square); DP Tyler Heckerman (The Cape); and Emmy award winning VR director, Ben Tricklebank (Clouds Over Cuba). Project is produced by GRAiNEY PICTURES and EVO Films USA. Schedule: We'll film Summer of 2018 through Spring 2019. Plan is to then complete the film by Fall 2019 in time for submission to Sundance and other premiere festivals. Goal is to then debut at a major festival and release the film Summer/Fall 2020 in advance of the 2020 Presidential elections. A larger social impact campaign will then launch around the film release to provoke further debate on the issues . Project elements include a virtual reality (VR) short film, an interactive website, an augmented reality app, and a comprehensive educational initiative. Giving Back: With a topic this pressing, we feel it’s important we give back. 90291: VENICE UNZIPPED will donate ten percent (10%) of the film’s total profits to leading grass roots organizations and NGOs that are actively engaged in income inequality & homelessness issues in Venice, and across America. Funding: The project is being funded through a combination of equity investments in the Unzipped Movie LLC, non-recoupable grants, crowd-funding contributions, and tax-deductible donations to the film through its' fiscal sponsor, the International Documentary Association (please make donations by clicking on the Make A Donation tab above). A detailed investment prospectus (PPM) is available upon request. Why you? We'd truly value your involvement & support at our fundraiser as we craft, cast & compose this important story. Filming to begin this Summer across Venice. We can't wait to make and show you this film! THANK YOU!! !